The Bergamasco Sheepdog is a muscular, heavy-boned herding dog with a large head and a thick tail that hangs down to the hock and curves slightly upward at the end. The entire dog is covered with an abundant coat that forms mats. The Bergamasco is compact in profile but is just slightly longer than tall. The head is long, more or less, proportionate to the size of the dog, with the skull and muzzle of equal length, parallel to one another, and joined at a pronounced stop. The skin on the head is tight with no wrinkles. Eyes – The eyes are large, oval, and set just slightly obliquely. Eye color is brown, with the darkness of the color varying with the color of the coat. The eye rims are tight-fitting and black. The expression is attentive and calm. Disqualifications – Any lack of pigmentation of the eye rims; one (or two) full blue eye. Ears – The ears are soft and thin and hang down on either side of the face. The ears are set on high. At its widest point, the ear is from 2½ to 3 inches wide. Ear length does not exceed half the length of the head, and shorter is preferred. The top two-thirds of the ear is triangular in shape, with slightly rounded tips. When the dog is alert, the ears prick up at the base, with the top two-thirds semi-drooping. Viewed from the side, the ears appear to be an extension of the curve of the back of the neck. The ears are covered with soft, slightly wavy hair, forming fringes at the tip. Neck – The neck is strong, slightly arched, and, measured from the nape to the forward edge of the withers, should be about 20 percent shorter than the length of the head. There is no dewlap. The hair on the neck forms a thick collar. Body and Topline – The line of the back inclines very slightly downward from prominent withers to a strong, broad back. The loin is well-muscled and broad. The croup is slightly sloping, about 35 degrees downward from the horizontal. Chest and Ribs – The ribs are well-sprung and let down to the elbows. The depth of the rib cage is equal to half the dog’s height at the withers. Tuck-up – Tuck-up is nearly absent. The shoulders are massive and strong. The shoulder blade is moderately laid back, about 60 degrees from the horizontal. The shoulder blades should be tightly knit. The upper arm is just slightly longer than the shoulder blade. The angle formed by humerus and shoulder blade is about 115 degrees. The vertical forearm is about the same length as the upper arm and is placed so that the point of the elbow is on a vertical line failing from the tops of the shoulder blade. The elbows are neither close to the body nor out. The wrist follows the vertical line of the forearm and is very mobile. The pasterns are straight when viewed from the front, and slightly sloping when viewed from the side (10 percent from vertical). The Bergamasco coat is made up of three types of hair: Undercoat, “goat hair,” and outer coat. The undercoat is short, dense, and of fine texture. It is oily to the touch and forms a waterproof layer against the skin. The “goat hair” is long, straight, and rough in texture. The outer coat is woolly and somewhat finer in texture than the “goat hair.” The “goat hair” and outer coat are not distributed evenly over the dog and it is this pattern of distribution that is responsible for the formation of the characteristic flocks (strands of hair weaved together creating flat layers of felted hair). Pelvis slopes at 35 degrees from horizontal. The upper thigh is long, wide, and well muscled. The upper thigh slopes downward and forward at a 95 degree angle from the pelvis. The lower thigh is as long as the upper, with strong bone and lean muscles. It slopes downward and backward, forming an angle of about 105 to 110 degrees at the stifle (femur-tibia). There is a well-defined furrow between the tendon and the bone above the hock. The distance from the point of hock to the ground is no less than 25 percent of the height at the withers. Viewed from behind, the rear pasterns should be vertical and parallel to one another. Viewed from the side, the rear pasterns are vertical and placed so that the hocks just slightly extend past a vertical line dropped from the point of buttock. Beneath the one-of-a-kind coat is a large, muscular shepherd dog of ancient pedigree. But, since the coat is the breed’s hallmark, let’s take a close look. The Bergamasco Sheepdog has hair of three different textures that form naturally occurring loose mats, or “flocks” (strands of hair woven together, creating flat layers of felted hair), covering the body and legs. The flocks provide protection from the fierce cold and wild predators of the Italian Alps, the breed’s ancestral homeland. Bergamascos are bright, loyal, loving, and trainable—with a dash of mountain-dog independence. They take to watching over loved ones with a serene vigilance. Wary of strangers until properly introduced, Bergamascos are aggressive only as a last resort. Want to connect with other people who love the same breed as much as you do? We have plenty of opportunities to get involved in your local community, thanks to AKC Breed Clubs located in every state, and more than 450 AKC Rescue Network groups across the country. 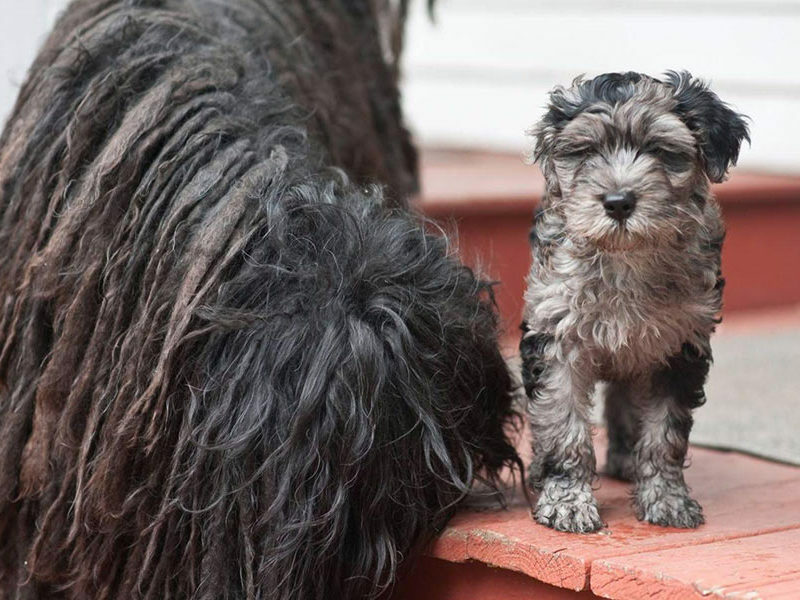 In February of 2010, the Bergamasco Sheepdog Club of America became the official AKC Parent Club representing the Bergamasco in the United States. The Bergamasco Sheepdog should do well on a high-quality dog food, whether commercially manufactured or home-prepared with your veterinarian’s supervision and approval. Any diet should be appropriate to the dog’s age (puppy, adult, or senior). Some dogs are prone to getting overweight, so watch your dog’s calorie consumption and weight level. Treats can be an important aid in training, but giving too many can cause obesity. Learn about which human foods are safe for dogs, and which are not. Check with your vet if you have any concerns about your dog’s weight or diet. Clean, fresh water should be available at all times. The coat of an adult Bergamasco is basically maintenance free. 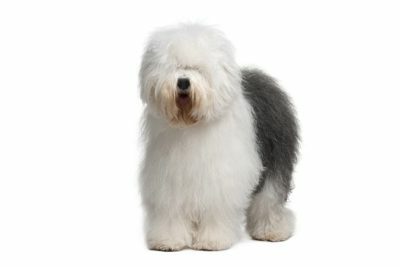 It’s made up of three types of hair, called “dog,” “goat,” and “wool.” Goat and wool hairs don’t start to appear until the dog is a year old. When they do, the coat must be ripped into mats—a process that can take a few hours or a few evenings. But once it’s done, it’s done. The felt-like mats grow over the course of the dog’s life, reaching the ground at approximately 6 years of age. A Bergamasco doesn’t shed, doesn’t need to be brushed, and doesn’t need to be bathed more than two or three times a year. The coat can actually smell like a sweater when it is wet. 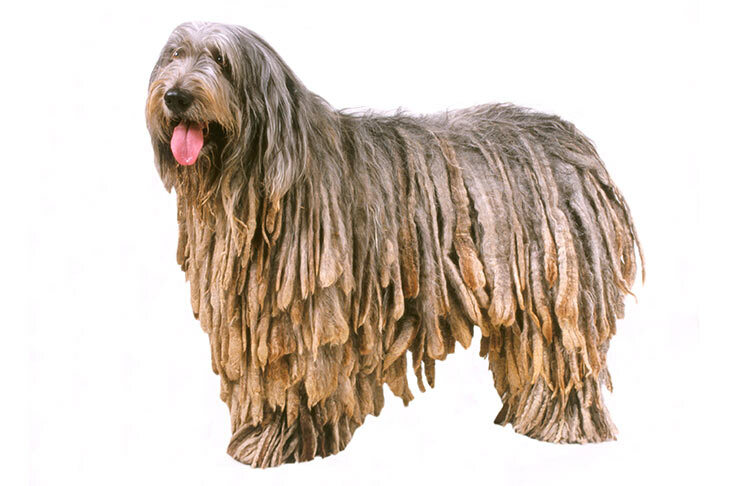 Most people with allergies to dogs are not allergic to the Bergamasco coat; however, those with allergies to wool or lanolin have been known to react. Because the coat aids in thermoregulation, a Bergamasco should never be shaved down. As with all breeds, the Bergamasco’s nails should be trimmed regularly. The Bergamasco Sheepdog requires only a moderate amount of exercise every day. Because they bond closely with their owners, this exercise should come in the form of some sort of mutual activity rather than the dog being left alone in the backyard. And while they are generally calm, Bergamascos have a good deal of energy and are happy to join their owners in almost any sort of activity, whether that entails retrieving a ball, going on a brisk walk or hike, or romping together in an open field. As with all breeds, early socialization and puppy training classes are recommended. Gently exposing the puppy to a wide variety of people, places, and situations will help him develop into a well-adjusted, well-mannered adult. The Bergamasco is a sociable, highly intelligent breed who possesses a deep desire to please his master. The breed thinks independently, however, and often sees itself more as an equal partner than as a subordinate to the members of his family. A Bergamasco who can be made to understand what is wanted of him, and why he should do it, will happily comply, if in his own way. Bergamascos are generally a healthy breed. Like all breeds there may be some health issues. Some dogs may be faced with these health challenges in their lives, but the majority of Bergamascos are healthy dogs. 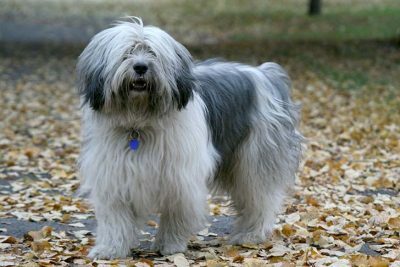 Bergamasco Sheepdogs (Italian plural: Bergamaschi) have been associated with the Alpine town of Bergamo, near Milan, for many centuries. They are among several Middle-Eastern breeds that were bartered around the Mediterranean basin in the distant past by the Phoenicians, wily seafaring traders of the pre-Roman ancient world. 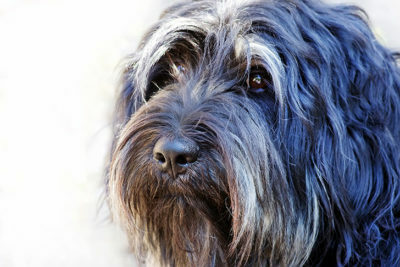 French authorities have theorized that the Bergamasco is descended from the Briard, an ancient Gallic herder. 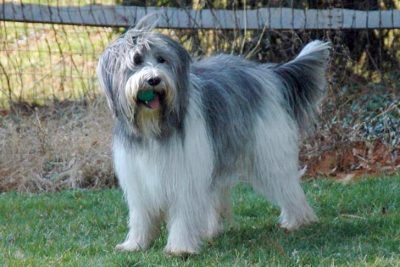 Patriotic Italians, however, insist that the Bergamasco came first and contributed to the genetic makeup of the Briard and other European flock-dog breeds. They make the sound argument that if the breed was originally Middle-Eastern, it must have arrived in Italy before it was established as far west as France. The Bergamasco’s numbers dwindled in Italy during the years after World War II, but more recently dog people around the world have rallied behind this serene but fearless protector. The breed’s American devotees scored a triumph in 2015, when the Bergamasco Sheepdog was admitted to the AKC Stud Book. The Bergamasco Sheepdog has been assigned the Herding Group designation. Bergamascos have extremely long upper eyelashes to keep the curtain of hair that falls from their forehead out of their eyes. The curtain of hair is to protect the Bergamasco's eyes from snowblindness. The Bergamasco is a very sociable animal, developing independent relationships with each person in the household, and relating to them in an individualized way. The Bergamasco Sheepdog is also known as the Cane da Pastore Bergamasco. The Bergamasco traces its origins back nearly 7,000 years to what is now Iran. The Bergamasco became eligible for AKC registration on December 1, 2014 and has been eligible to compete in the Herding Group since January 1, 2015. AKC will maintain an open registry for the breed until January 1, 2020. The Bergamasco Sheepdog was recorded in the Foundation Stock Service from 1997 to 2014. The Bergamasco had been approved to compete in the Miscellaneous Class from January 1, 2011 to December 31, 2014. Despite its formidable appearance, underneath that coat the Bergamasco Sheepdog is really a trim, athletic dog weighing 57-84 lbs, with no tendency to overeat. The Bergamasco has extremely acute hearing and an almost psychic awareness of its environment. With these faculties, they can be very reliable predictors of approaching visitors or violent behavior. They have even been known to warn unsuspecting people that another dog was preparing to attack. The Bergamasco has been eligible to compete in Companion Events since January 1, 2008.